I had really good intentions of posting this recipe earlier in the month, when people were still sticking to their new years resolutions. I had big plans for a “salad week” to follow “soup week,” but “soup week” turned into just “three days of soup,” and then things got a little busy and I dropped the ball on salad week entirely. Never fear, though, because it’s still January for three more days. And besides, this salad is so good I think it can be enjoyed long after we’ve given up on our resolutions. There was a time, not too terribly long ago, when the thought of raw kale made me wary. I loved it in soups, or sautéed as a side dish, but I really thought the bitterness needed to be cooked out in order for it to be edible. My friend Lindsay told me about this salad, and I must have sounded skeptical because she then sent me the cookbook and demanded that I make it immediately. As soon as I tried it I was converted. 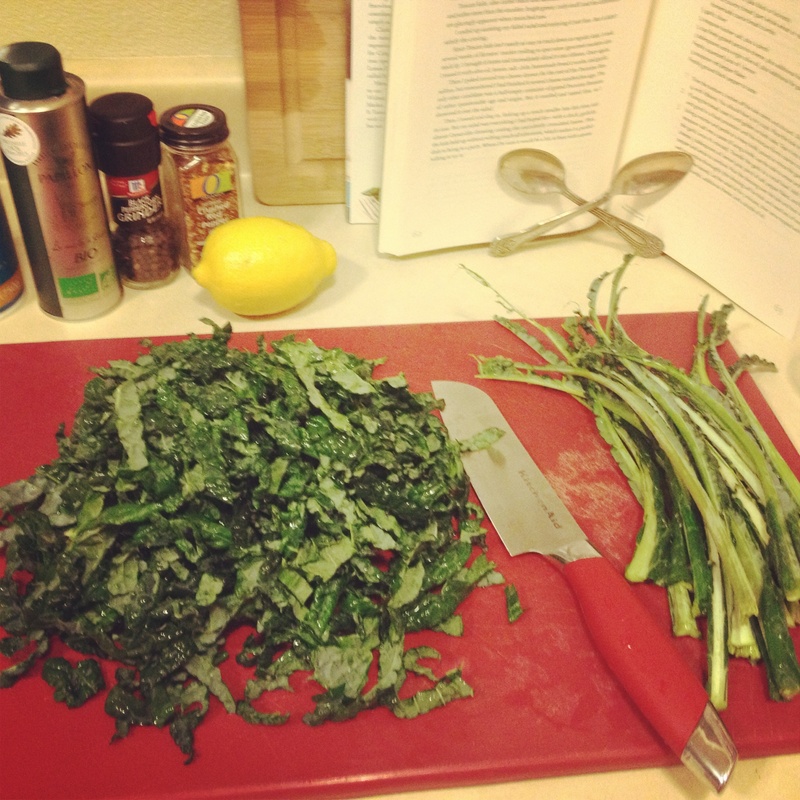 The two tricks are: (1) make sure to use Tuscan kale (aka dinosaur, black, or lacinato), and (2) take the “ribs” out. Tuscan kale is better raw than other kale varieties, and the ribs are what makes it bitter, so once they’re gone you’re golden. I really think cutting the leaves into thin ribbons helps, too, for presentation if nothing else. The dressing is the best part – almost like a Caesar dressing, but without the egg and anchovy (which are the reasons I won’t eat a Caesar salad). Just whisk (or blend) olive oil, lemon juice, and good parmesan with a little salt, pepper, a pinch of chili flakes, and garlic. Melissa’s recipe calls for raw garlic, but as I’m not a raw garlic lover I roasted mine first. 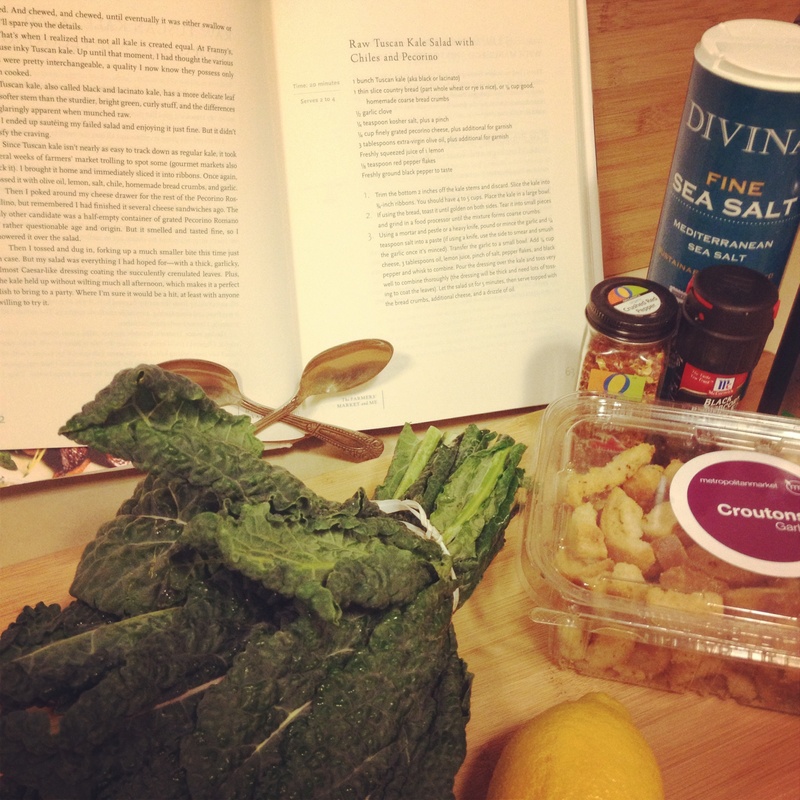 Coat the kale with the dressing and breadcrumbs and you have yourself a delicious, healthy treat. I’m now pretty into ordering a kale salad whenever I see it on a menu, and with the exception of the “marinated lacinato kale” at Tom Douglas’s Serious Pie, I have yet to find one that beats this. 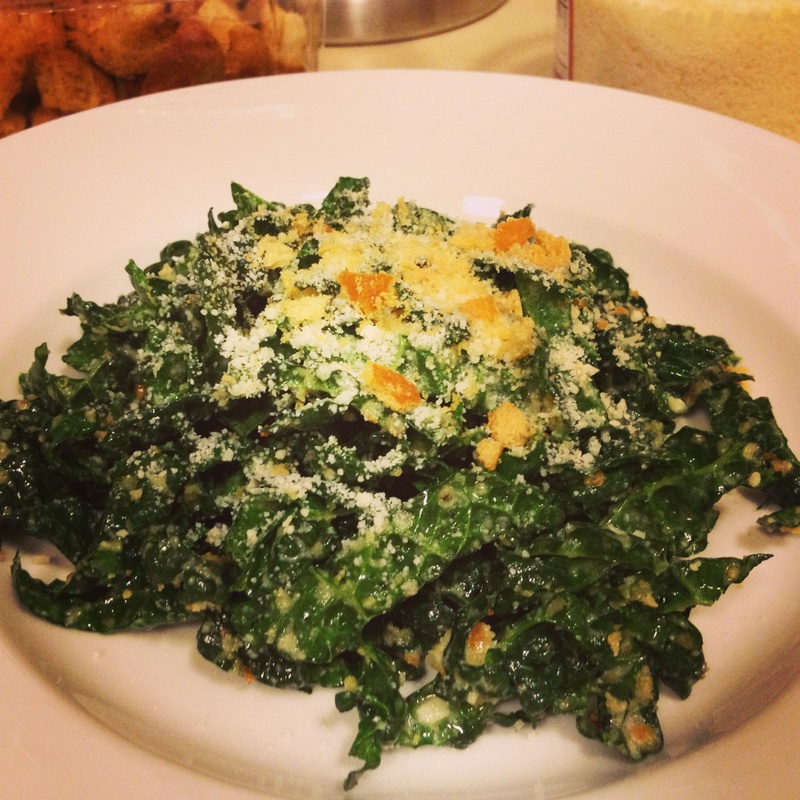 Kale salad, previously: here (scroll all the way to the bottom). Kale otherwise, previously: White Bean and Kale Soup, Kale Pesto. 3. Using a mortal and pestle or a heavy knife, pound or mince the garlic and 1/4 teaspoon salt into a paste (if using a knife, use the side to smear and smush the garlic once it’s minced). Transfer the garlic to a small bowl. 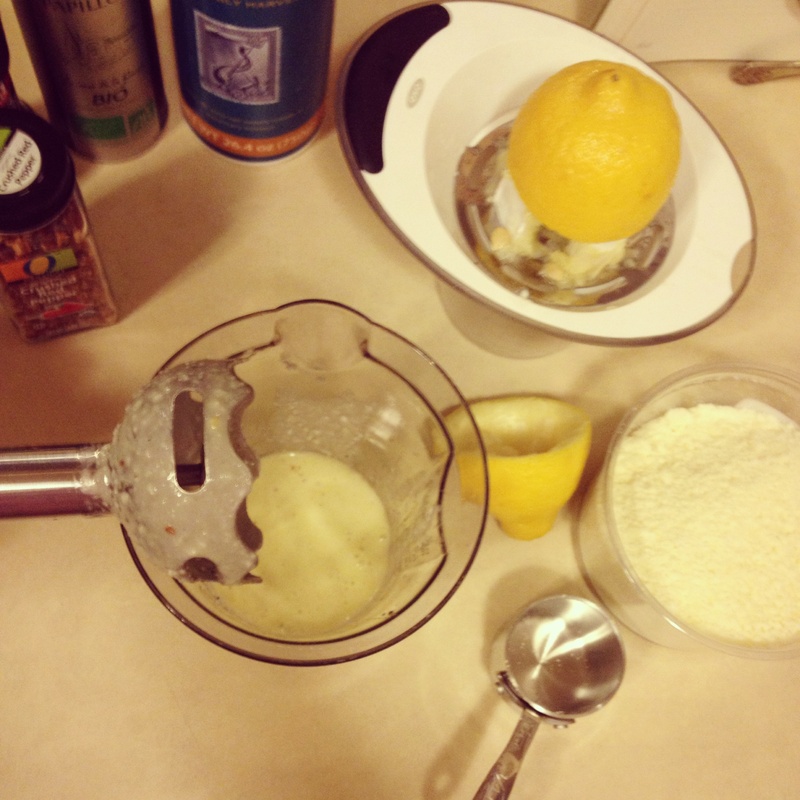 Add 1/4 cup cheese, 3 tablespoons oil, lemon juice, pinch of salt, pepper flakes, and black pepper and whisk to combine. [Note: I do this with my immersion blender, which I think makes it extra creamy – and lets you skip the “smooshing the garlic” step. Also I used a whole clove of roasted garlic rather than half a raw clove.] Pour the dressing over the kale and toss very well to combine thoroughly (the dressing will be thick and need lots of tossing to coat the leaves). Let the salad sit for 5 minutes, then serve topped with the breadcrumbs, cheese, and a drizzle of oil. What did we do before kale? Bookmarking this one, yum!